Health System Review is your destination for the most important articles about healthcare. 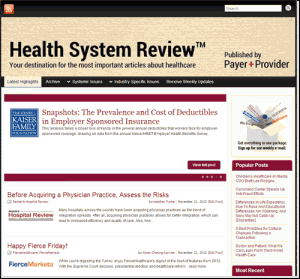 Payer+Provider Syndicate produces both a healthcare portal and a weekly healthcare newsletter. The portal contains content from the most trusted names in healthcare, instantly and automatically sorted into channels by topic. The handcrafted Health System Review newsletter contains articles that we feel are especially likely to be of interest to our readership. 11/7/12 What will the 2nd term of the Obama Presidency mean for healthcare?